Onions: In Your Food, On Your Feet, By Your Nightstand…..What?! A couple of years ago I read somewhere about onions being such strong anti-bacterial agents that if you cut one in half and put it in a dish on your nightstand, in the morning it would be all black from attracting all the germs and “greasy grime” in the environment. I was thinking about that a few months ago and wishing I’d saved the article because I wanted to refresh my memory on the facts, plus include the info in a post about onions because they keep coming up, along with garlic, as such good anti-cold and flu agents. Anyway, I had been wanting to research the topic, but hadn’t found the time to get around to it. Then boom and viola! An e-mail showed up right after that that actually contained info about that very thing. Talk about synchronicity and serendipity! Onions have countless uses in the kitchen and are a chief ingredient in many sauces, salads and entrees, but to think of them only as a cooking ingredient overlooks the fact that they are also nutritional and healing powerhouses. Eating an onion a day (ideally raw) could be one of the most effective and inexpensive ways to safeguard your health, especially during wintertime. Onions, particularly red and yellow onions, are fantastic natural sources of the well-studied flavonoid quercetin. According to the University of Maryland Medical Center, quercetin acts like an antihistamine and an anti-inflammatory, and can guard against heart disease and cancer. These claims are now being proven by research. For example, one study published in Gastroenterology in January 1996 found that eating half of an onion a day could cut the risk of developing stomach cancer by 50 percent. Wow! And a later study published in the British Journal of Nutrition found that quercetin could significantly reduce the concentrations of LDL cholesterol in overweight subjects, thereby decreasing their risk of cardiovascular disease. The pungent taste and aroma of onions, as well as their famous release of eye-watering gases when chopped, is due to their allicin content. Allicin is also found in garlic, another common kitchen ingredient and nutritional powerhouse. Allicin is an organic sulfur compound which, like quercetin, possesses anti-inflammatory properties and can help prevent cancer. Moreover, research featured in Microbes and Infection in 1999 showed that allicin is a potent anti-microbial, anti-viral and anti-bacterial, and can kill common (and increasingly antibiotic-resistant) microbial cultures in the body such as Candida albicans and E. coli. Since viruses thrive in cold weather, eating more onions in winter really is a good idea! Although the allicin in onions is best-known for treating disease, it has also been linked to reduced blood sugar. A research paper published back in 1975 in Experientia proved that diabetic rabbits that were treated with allicin extracts experienced “significantly reduced” blood sugar levels and glucose-nitrogen ratios. We now know that this is because allicin competes with insulin in the liver, which encourages the body to manufacture more of it. This helps transport glucose through the body, thus reducing blood sugar levels. Additionally, onions are also a top source of chromium, a trace mineral that enhances the actions of insulin. Therefore, diabetic or pre-diabetic individuals can help stabilize their blood sugar levels by adding more allicin-rich foods like onions to their diets. One medium-sized onion also contains a surprising number of additional nutrients. This includes approximately 20 percent of our recommended daily intake of the essential antioxidant vitamin C, as well as varying amounts of protein, fiber, potassium, magnesium, manganese, calcium, iron and most of the B vitamins. Obtaining these nutrients from whole foods like onions is the best way to optimize biosorption rates. 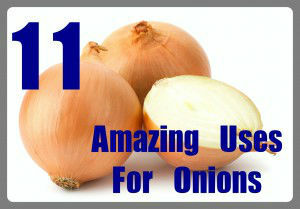 And from The Alternative Daily, here are 11 of the amazing ways you can use onions more often….. While it definitely sounds a bit bizarre, onions are even said to cure insomnia. Just cut into a raw onion and take five to ten deep breaths of its aroma. For the best results, place it into a glass jar and put it beside your bed – take a whiff just before laying down. To remove dark spots on your skin, slice a red onion and rub it directly onto dark areas of the skin after cleansing. Used on a daily basis it can help lighten hyper-pigmentation. 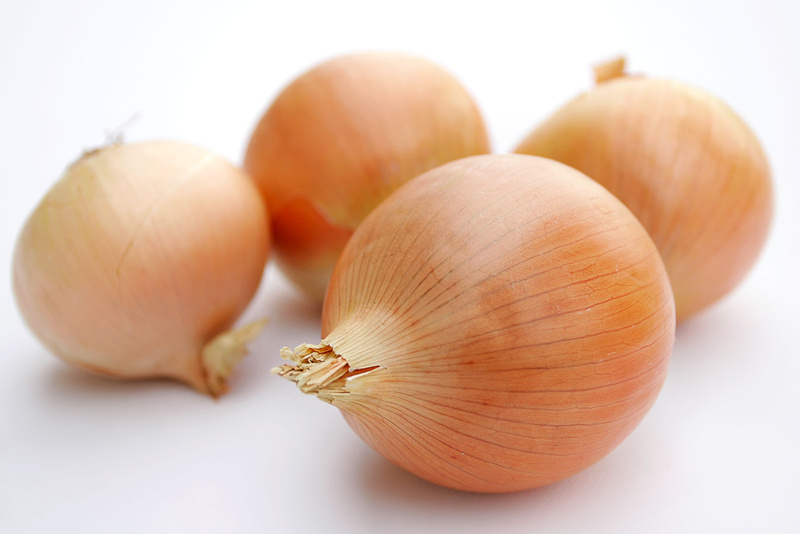 Onions are known as one of the best soothing agents for menstrual cramps. Consuming raw onions regularly during four to five days before your period can help ease the pain. The agent that gives onions their strong smell, allicin, is also responsible for increasing blood flow to the sexual organs, resulting in increased sexual drive. As onions contain a significant amount of phyto-chemicals in addition to high levels of vitamin C, they can help strengthen your immune system, providing a strong defense against the common cold or flu. Onions’ sulfur-containing amino acids offer a detoxifying effect which helps the liver process things like caffeine and acetaminophen as well as converting pesticides, lead and dry-cleaning solvents into forms that are less toxic and easier for the body to eliminate. Forgetting about the issue with foul breath for a moment – chewing raw onions for several minutes can help prevent tooth decay and oral infections by killing harmful germs present in the mouth. Just brush your teeth and use a mouthwash afterward to get rid of the smell. Chewing a fresh sprig of parsley can also help. Studies have shown that consuming onions regularly can also help balance blood sugar levels. Onions are a good source of fiber, potassium, vitamin C and many other micro-nutrients, compounds which further help to support normal blood sugar levels. Research has found that organosulfur compounds, found in both onions and garlic, prevent the development of cancers by detoxifying carcinogens and stopping cancer cell growth. High onion intake has been associated with a 56 percent lower risk of colon cancer and a 25 percent lower risk of breast cancer compared to no onion intake. Rubbing half an onion on your face daily can help to eliminate blemishes without leaving acne scars or the long list of side effects which can come from acne medications. Onions are truly an amazing food – use them frequently in your meals. They’re one of the most versatile vegetables and can be consumed raw or cooked, imparting a unique flavor to almost any recipe. I heard one of my teenage daughters talking to someone the other day about treating a fever, and she said, “Put some onions on your feet.” I couldn’t believe how bizarre that sounded. However, that is how I raised my kids. From as young as they can remember, I would initially treat a low-grade fever with white onions, putting a few slices on each foot and pulling on their socks. Using onions for healing is nothing new. In Europe, onions were used to fight off sickness in the early 1900s, and Ayurvedic medicine has been using a poultice for the chest or feet to treat coughs, flu and fevers for centuries. The Hutterites, a North American pacifist community similar to the Amish, place cut onions throughout their home during cold and flu season because they believe the onions keep the germs away. Onions are rich in sulphur-containing compounds that are naturally detoxifying. In addition, onions are the richest dietary source of quercetin, a highly potent antioxidant that has been shown to thin the blood, combat asthma, chronic bronchitis, diabetes, infections, and has been linked to inhibiting certain cancers. Onions also have strong anti-inflammatory, antibiotic and antiviral properties. So, don’t forget to add plenty of onions to your diet to help protect you from even the nastiest of bugs. And here’s a list from Tropical Health that includes some uses not mentioned by The Alternative Daily. Ideally, peel off only the outermost paper-like layer. Peeling too many layers can reduce the onion’s quercetin and anthocyanin content by as much as 20 percent and 75 percent respectively.20 One piece of good news is that quercetin does not degrade when cooked over low heat, so when you’re making soup, for example, it simply transfers into the broth. And now for the fun and exciting part about onions that came in the e-mail I was talking about. It was from Dr. Jane Goldberg, health enthusiast and owner of La Casa Day Spa in NY. She’s always got some interesting information to pass along and this time it was exactly what I’d been waiting for. Here’s what she said…. In 1919, when the flu killed 40 million people, so it is said, there was one doc who visited his neighbor farmers to see if he could help them combat the illness. As he was to discover, many of them, as well as their families, had contracted the flu, and had died. However, the doctor came upon one farmer, and saw that everyone in his family was still healthy. The wife explained that she had placed an unpeeled onion in a dish in each of the rooms of the home. The doctor was puzzled, and asked if he could have one of the onions to examine it under the microscope. He found the flu pathogen in the onion. The onion had seemingly absorbed the flu pathogen, thereby, happily storing it away from the family, and keeping them healthy. Onions have powerful antibacterial, antiseptic properties. The fact that they have the capability of absorbing bacteria and viruses is the reason they are so good at preventing us from getting colds and flu. But this is, also, the very reason we shouldn’t eat an onion that has been sitting for a time after it has been cut open. Leftover onions are toxic. One of the people providing information for this piece took a tour at Mullins Food Products, an Illinois company that makes mayonnaise. Questions about food poisoning came up during the tour, and the guide’s answer was surprising. He maintained that all commercially-made mayo is completely safe. The guide said that when food poisoning is reported, the first thing the officials look for is when the ‘victim’ last ate onions. He was clear that the culprit is not the mayonnaise (as long as it’s not homemade mayo) that spoils in the outdoors–but rather, it’s much more likely to be the onions. He explained that onions are a huge magnet for bacteria, especially uncooked onions. He suggested to be careful with onions on hot dogs at the baseball park, and never keep a portion of a sliced onion. He said it’s not even safe if you put it in a zip-lock bag in the refrigerator. It becomes highly toxic when left open for even a single night, and creates bacteria which can cause adverse stomach infections, or food poisoning. And, finally, dogs should never be given onions. Their stomachs cannot metabolize them. I’m definitely going to try the onion on the nightstand (and soles of my feet) routine and see what happens. Fascinating stuff! Also, since reading the part about not using leftover cut onions, I have been more cautious about keeping them more than a day or two in the fridge. So far I haven’t had a problem, but then I use a BerryBreeze™ unit, which neutralizes pesticides and toxins, so that might be the reason. Related Self-help Health posts: Let’s Hear It For Red Onions! p.s. Be sure to subscribe to Self-help Health so you don’t miss any future posts. Also check out my new website Evolution Made Easier and blog of the same name for more helpful information, tips, tools and resources. If You Eat Ice Cream, Be Sure To Read This! Mycobacterium vaccae: Bacteria That’s GOOD For Your Brain!! so I tried it for 3 nights. I just put on a new mattress cover with clean sheets on my bed and then I cut a onion in half put it in a bowl on my nightstand. 3 days later I went to change my sheets and I noticed that where I slept the mattress pad was yellow in the shape of my body. My lungs were so much better. Works great. Oh, Vicki, thanks so much for taking the time to share about your experience! I think that will be so helpful to people and for them to know that it may take a few days/nights to get results. Also, that maybe they will want to sleep on something they don’t mind possibly ending up with a body shape on. HA!